“Ambient (outdoor air pollution) in both cities and rural areas was estimated to cause 3.7 million premature deaths worldwide in 2012”, according to a World Health Organization factsheet Ambient (outdoor) air quality and health published in 2014. In the UK alone the Royal College of Physicians estimated in ‘Every Breathe we Take” that “around 40,000 deaths are attributable to exposure to outdoor air pollution” and in the UK “these costs add up to more than £20 billion every year”. WHO then related the solving of air pollution to the solving of CO2 problems “Reducing outdoor air pollution also reduces emissions of CO2 and short-lived climate pollutants such as black carbon particles and methane, thus contributing to the near- and long-term mitigation of climate change.” The pollution is not confined to road pollution in wealthy cities. See Indonesia Burning for corporate sabotage of a natural environment. However, in Oct 2015, when the EU passed the legislation to bring in Real World Driving Emission (RWED) tests for car emission tests they also raised pollutant limits so that diesel cars would not fail and become unsaleable. There are no margins for allowable excesses for the EU limits. See the UK section for legal action on exceeding the limits. Defra published EMISSIONS OF AIR POLLUTANTS IN THE UK, 1970 TO 2015 in Dec 2016. Defra also commissions the Committee on the Medical Effects of Air Pollutants (COMEAP) to research the health and mortality outcomes. COMEAP published “Estimating local mortality burdens associated with particulate air pollution” in April 2014. They subsquently issued a statement in Dec 2015 saying that they are investigating how to include NO2 deaths in their next report due in 2016. To view the list of DEFRA London Automatic Air Monitoring Sites click here. Also the Air Quality England website that includes Ricardo Energy and Environment data sets for 18 sites. For Defra’s London Borough’s Air Quality Management Areas (AQMA) click here. For a Real Time view of London Air Quality click here. In response Defra published Summary of responses to the government’s consultation on draft air quality plans in Jan 2016 setting the intention to consult on ‘Clean Air Zones’ by 2020. and submitted its plan to the EU in Dec 2015. This plan is to consult on setting up Clean Air Zones in 5 cities around 2020 and conduct scoping studies (they said that 6 cities were projected to be over the limits by 2020 but London has special independence). Lord Gardiner of Kimble gave Defra’s response to the Lords on 3rd Nov (at 15.08) confirmed that the Government was aiming at doing as little as possible to try to be legal, that Clean Air Zones in 20 Cities had been discounted on cost grounds and that the Government expected that Local Authorities, whilst charged with monitoring and reporting NO2, were somehow expected to solve the problem caused by increasing diesel vehicles. He also mentioned the issue of EU limits for diesel emissions causing health problems, but did not mention that the UK had voted to relax EU NO2 limits when testing changes to ‘Real World’ testing. In Oct 2015 the EU passed the legislation to bring in Real World Driving Emission (RWED) tests for car emission tests. But, as Air Quality News reported the limits for nitrogen oxide (NOx) emissions for diesels would be temporarily raised. The Guardian reported that the Government failed to submit a plan that would bring the UK into compliance with the law “as soon as possible” and this will return to the Courts. Update 21st Nov 2016: – The High Court gives Defra until 24th April 2017 to produce a draft plan and a final, agreed, plan by 31st July 2017. Client Earth has the right to inspect the data, particularly the assumptions as to whether levels were based on Lab testing or Real Driving test conditions. 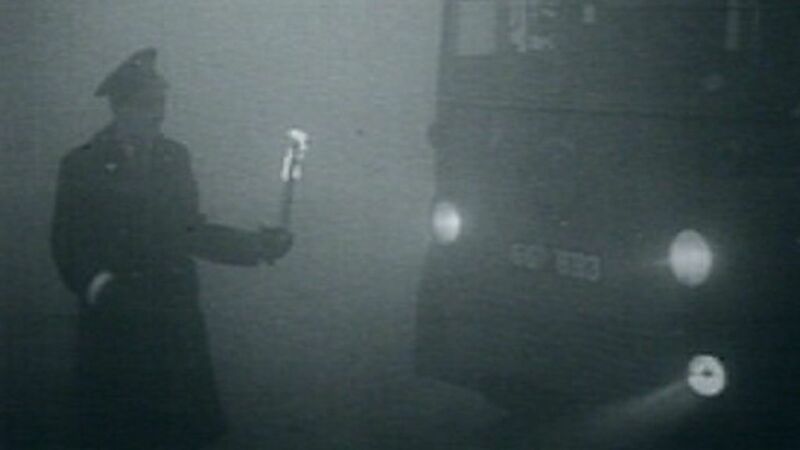 From the Met Office: “smoke-laden fog shrouded the capital from Friday 5 December to Tuesday 9 December 1952. During the period of the fog, huge amounts of impurities were released into the atmosphere. On each day during the foggy period, the following pollutants were emitted: 1,000 tonnes of smoke particles, 2,000 tonnes of carbon dioxide, 140 tonnes of hydrochloric acid and 14 tonnes of fluorine compounds. In addition, and perhaps most dangerously, 370 tonnes of sulphur dioxide were converted into 800 tonnes of sulphuric acid. Friends of the Earth says that the Clean Air Act of 1956 “for the first time regulated both domestic and industrial smoke emissions. Historians widely considered it to be an important milestone in environmental protection. 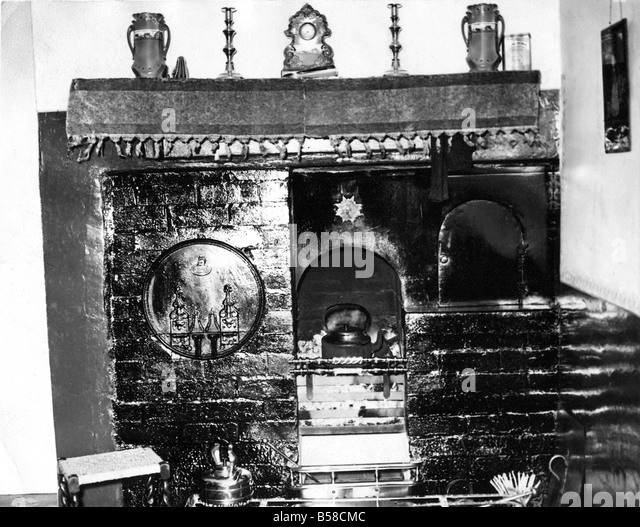 The legislation included powers to establish ‘smokeless zones’, and provided generous subsidies to householders to convert to cleaner fuels (smokeless solid fuel, gas and electricity). Undoubtedly the deaths from exposure arose from different causes at different locations, so understanding the dangerous levels and causes along main roads, outside schools, near railway tracks and runways is the first step to insisting on London wide solutions. Clean Air for London contains raw data on the sources of emissions in the Greater London Area, and Camden has summarised these succinctly in its draft Camden Clean Air Action Plan 2016-18 Draft Action Plan for public consultation February 2016 (p10). Note that this is only an average across London. 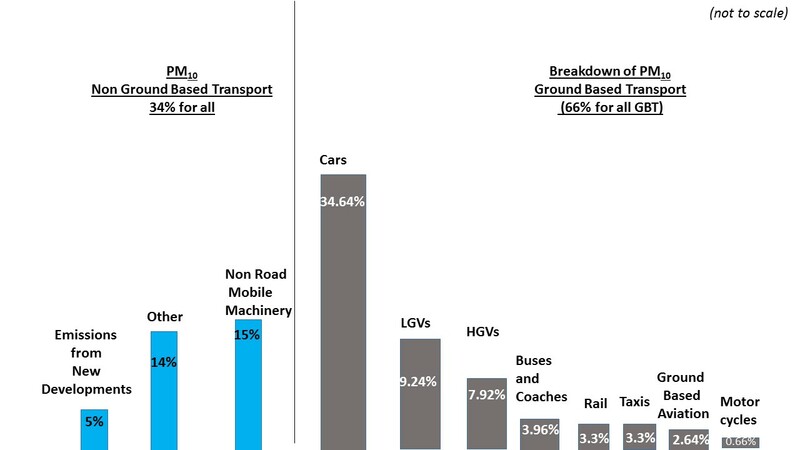 Roads near Heathrow will have a higher percentage of Ground based Aviation pollution, and roads near the HS2 construction site will have much high construction pollution. A specific local cause of pollution that is threatened is that of a cruise liner terminal at Enderby Wharf (North) at Greenwich. East Greenwich residents obtained a Judicial Review in April 2016 saying power should be provided dockside rather than from polluting diesel engines, and that Greenwich Council the Council had not conducted the environmental assessment correctly in granting permission. “There are 187 Air Quality Focus Areas in the Capital. These are locations that not only exceed the EU annual mean limit value for NO2 but are also locations with high human exposure.” The Data Store here also has a spreadsheet listing the hot spots and a map. The Mayor of London offers a Mayors Air Quality Funding (MAQF2 for 2nd round) over 3 years from April 2016 with £2million for Low Emission Neighbourhoods (LENs) and £6 million for all other standard projects. to ensure an Air Quality Management Area (AQMA) is declared and in place for any locations that are exceeding air quality objectives and EU Limit Values. to produce an Air Quality Action Plan (AQAP) for the exercise of any of the borough’s relevant potential powers to achieve air quality standards and objectives including statements as to when the borough proposes to implement each of the proposed measures. Roads – TfL are responsible for the Red Routes, which are likely to be the most highly polluted of London’s roads. Taxis – TfL is “the licensing authority for London’s taxi and private hire operations, including minicabs, executive cars and chauffeur-driven services”. The Low Carbon Vehicle Partnership reported in Oct 2015 that from “1 January 2018, all taxis licensed for the first time in London must be (ZEC) zero emission capable (less than 50g/km tailpipe CO2 and 30 miles ZE range) according to plans outlined by Transport for London. Additionally, any ZEC taxi can only use petrol for its hybrid engine. For private hire vehicles the intention is that all vehicles granted a PHV licence for the first time after 1 January 2023 must be zero emission capable, regardless of age. Although Taxis’ maximum permitted life is 15 years and Private Hire Vehicles (PHV)s is 10 years, TfL is providing £65 million to help drivers buy new greener cabs five years before their old ones are out of date, according to LowCVP. For a list of London’s Air Quality Management Areas (AQMA) click here. For a list of London’s Air Quality Focus Areas click here. For a list of London’s Continuous Monitoring Sites click here. For a view of Londons’s daily maximum index values at monitoring sites click here. To download a mobile App of Londons Air Quality click here. The Vehicles on London Roads. Transport for London (TFL) describes the planned Ultra Low Emission Zone (ULEZ) as “an area within which all cars, motorcycles, vans, minibuses, buses, coaches and heavy goods vehicles (HGVs) will need to meet exhaust emission standards (ULEZ standards) or pay an additional daily charge to travel. TfL consulted on details of the ULEZ closing in Jan 2015, with conclusions listed here. However, prior to 2020 motorists, fleet operators, commercial concerns and Taxi drivers are still buying vehicles that will pollute prior to 2020 and unwittingly be charged more to drive around London after that. See ‘Your Car’ for information on ‘clean’ cars, in particular about Electric Cars.